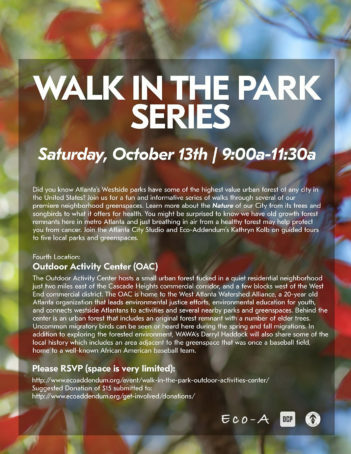 Enjoy a neighborhood urban forest walk at the Outdoor Activity Center (OAC) greenspace co-hosted with Atlanta City Studio, as well as the kickoff for our new Eco-A/West Atlanta Watershed Alliance Stewardship Walk series. At 9:00 am we’ll have a meet and greet with coffee and donuts and a short slide show before our walk begins at 10:00 am. Our Stewardship walks and volunteer sessions help you become an expert on the urban forest in your neighborhood, and you’ll have the opportunity to become a certified naturalist or docent for your favorite neighborhood forest. Join your friends and neighbors in learning more about, and helping to care for, the Outdoor Activity Center and Cascade Springs greenspaces. 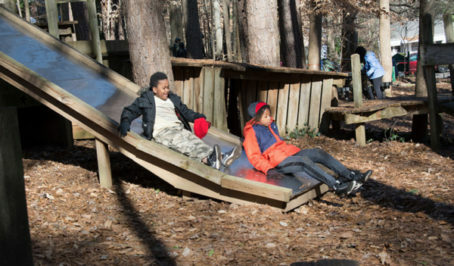 The Outdoor Activity Center (OAC), located on Richland Ave, hosts a small urban forest tucked in a quiet residential neighborhood just a few blocks west of the West End commercial district. 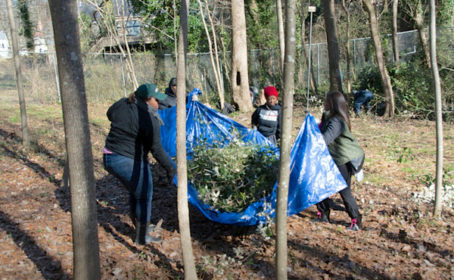 The OAC is home to the West Atlanta Watershed Alliance (WAWA), a 20-year old Atlanta home-grown organization that leads environmental justice efforts, environmental education for youth, and connects westside Atlantans to activities in several nearby parks and greenspaces. Behind the center, which hosts urban agriculture garden and native plantings, is an urban forest that includes an original forest remnant with a number of elder trees, including a Beech tree dating back to the mid-1800’s. Oaks are found on the ridges, moister slopes give rise to tulip polar and beech, while the creek and swales host floodplain species. Uncommon migratory birds can be seen or heard here during the spring and fall migrations, and many species of year-round bird residents, including several hawks and owls, can be found any time of year. Parts of the park suffer from infestations of invasive species, and this event will provide further opportunities to help restore this greenspace. 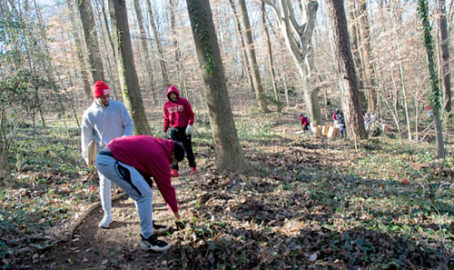 In addition to exploring the forested environment, WAWA’s Darryl Haddock will also share some of the local history which includes an area adjacent to the greenspace that once was a baseball field, home to the Atlanta Black Crackers, a well-known African-American baseball team during the time when Atlanta’s sports teams were segregated. In case you’re wondering, the name “cracker” was derived from the hallmark sound of good baseball — the “crack” of the ball on the bat. This event is co-hosted by Atlanta City Studio, West Atlanta Watershed Alliance and Eco-A.